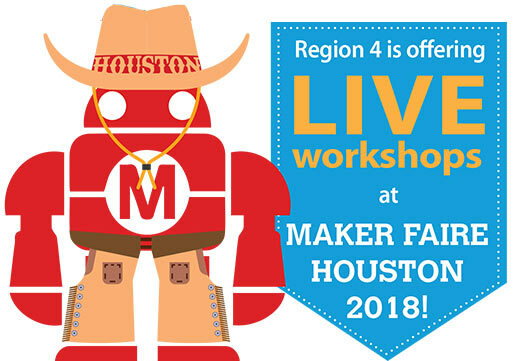 Region 4 ESC and seven area school districts are excited to offer LIVE hands-on workshops at Maker Faire Houston 2018. Maker Faire is a worldwide maker movement event featuring a family-friendly showcase of invention, exploration, and fun with makers ranging from tech enthusiasts to crafters to scientists to garage tinkerers and more! The 2018 Houston Maker Faire welcomes all students and PreK–12 educators to connect and grow the Houston Makerspace community at the George R. Brown Convention Center on October 13–14, 2018. Region 4 offers innovative professional development workshops that are research-based, aligned to the TEKS, and designed to enrich classroom instruction and improve student learning. Questions? Contact us today at solutions@esc4.net to learn more.